on fulfilling your dream. The A.T. is such an adventure with so many obstacles to overcome. Some journals are more interesting than others but I have not been able to stop reading yours. I have read about half and read some every day . . .
months and help me get through until Spring when I can hit the trail again." I mentioned in the last entry that one of the greatest joys this journal has brought us is new friends. Two who have become close are Eric and Lynn Rathbun, who live in a small town in Maine. Eric first wrote to us about six weeks after we finished our Appalachian Trail Adventure Run in 2005. He had been searching the internet for information about AT hikes and stumbled on our website. He had already hiked a number of miles of the Trail in Maryland, Pennsylvania, New Hampshire, and Maine when he realized he could probably finish the entire 2,175 miles during vacations from work over the next five to seven years. Because of chronic back problems, Eric had no intention of back-packing the entire AT. When he saw the way I ran and hiked the trail with Jim's crewing assistance, sleeping in our camper each night and trekking the Trail by day, he knew he'd found kindred spirits and the inspiration he needed to begin his quest. Lynn was equally enthusiastic about Eric's goal, and volunteered to crew him until he reached his goal. Since then we have had frequent contact with each other. Eric is a "habitual hiker," getting out into the woods and mountains in northern New England nearly every weekend of the year. He loves hiking in the winter as much as in warm weather and has gained many friends in the process. 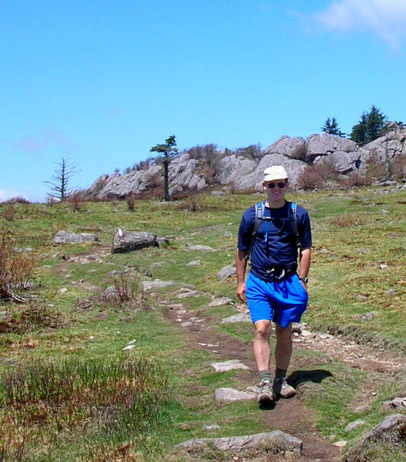 In addition to his quest to finish the entire Appalachian Trail, he has added other challenging goals such as hiking the high point in as many states as possible, hiking all the peaks over 4,000 feet in New England, and hiking each of the 48 peaks over 4,000 feet in the White Mountains of New Hampshire each month for a year ("The Grid: 48 X 12"). Two years ago Eric bravely joined Jim and me in his first footrace of any length, the Capon Valley 50K in West Virginia. He had just finished hiking about 200 miles of the AT in Virginia, Tennessee, and North Carolina and was on his way back home with Lynn. I'm not sure if we first encouraged Eric to run/hike the race or if he asked us if we thought he could do it. Either way, we knew he was such a strong hiker that he could finish the race without running a step. Eric DID run some of the race, finished in a good time, had fun -- and decided he liked hiking better than running! As addictive as ultras are, however, we figured he'd eventually do another one. Although he's been very busy working on several different hiking goals, he did (finally) sign up for a trail 50K near his home this coming Memorial Weekend. We knew he'd be back. Eric is not only a fast and strong hiker, he is also a determined one. In only three and a half years since he first contacted us, he has accomplished his dream of hiking the entire Appalachian Trail a section at a time. Much of northern New England he was able to hike on weekends or during one-week forays from his home in Maine. He finished longer sections from Georgia to southern New England on longer, two- and three-week vacations. 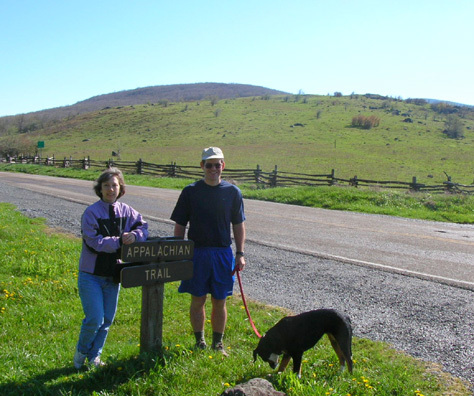 We enjoyed hosting Eric and Lynn at our house several times when they were passing through Virginia on their way to or from sections of the AT in the southern states. 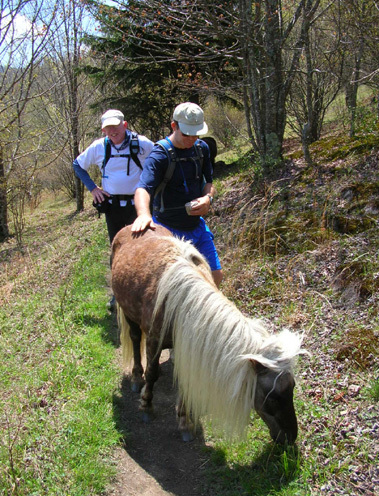 We also had the privilege of hiking with him twice on the AT, near Roanoke and in the Virginia Highlands. The most recent visit we had with Eric and Lynn was a couple of weeks ago. Section-hiking has its advantages but it is also more difficult than a thru-hike in some ways. It takes a lot of patience, time, and tenacity to accomplish this goal over a period of several years. 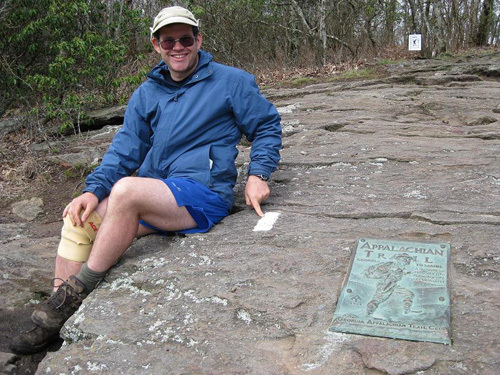 But Eric happily finished all 2,175 miles of the AT at Springer Mountain, GA, the southern terminus of the Trail, on April 14, 2009 -- two or three years faster than he originally predicted. 'Way to go, Eric!!!!! Welcome to the "2,000-Miler Club." Lynn deserves major congratulations, too. Crewing someone on any long trail is tough work! Just ask Jim. Eric has a great website with well-written journal accounts of all of his AT hikes, as well as many of the other trails he's hiked in New England and other areas. His site is easy to navigate, full of interesting stories, humor, and beautiful photos, and very inspiring. Check it out!